I’ve been in and around for ages on this interwebby thing. Problem is, now I think about it, it appears I have a split personality. Claretsgirl and being a football fan or One Foot in the Grapes and enjoying wine (errrmmm quite a bit) or Jane Clare and both? Mmm. I’m all three – but can I be all of these things out there in the ether? I’m not sure to be honest. It’s all very confusing. Right. Here’s the story of my identity crisis. 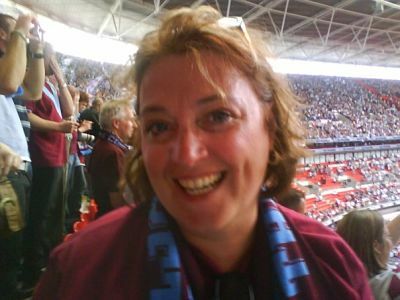 Moons ago (in football terms it was the end of the 2008/ 2009 season) I joined Twitter as @claretsgirl. This was a very exciting time for Burnley FC fans. When I joined Twitter, we’d just won promotion to the Premier League. If you don’t follow footie this was a BIG thing for a club from a small Lancashire town, a club nonetheless steeped in football pride and history. My dad and his family had supported the Clarets for decades; I was the latest recruit. At the time Twitter was a newish thing and all the guys in our Liverpool newsroom were using it. I didn’t get it – “but its a good source of news and finding people with similar interests” I was told. Fair enough: As footie was HUGE for me at the time, I joined wearing my Burnley fan “hat” and eagerly hunted around for other Burnley fans on Twitter to share the joy. Someone nicknamed our embryonic group of tweeting Clarets’ fans the #twitterclarets (High Five to @Hop3y for that) and we were as giddy as kids in a sweet shop with extra E-numbers drizzled on top. Remember those days of tweet-ups. Tweety people met in pubs (preferably) or coffee houses (not me) to put faces to Twitter names and to prove to each other they could speak in sentences that contained more than 140 characters. I met one chap who’d followed me on Twitter because he thought the clarets in claretsgirl stood for wine. Poor chap. He was disappointed it was “only” football (he definitely wasn’t a football man). Saying that, he was unknowingly giving a nod to the future. As it was, @claretsgirl was on Twitter and not a glass of wine in sight (well, that bits a lie, but you know what I mean). Back on track with the story. Two things happened. One not-so nice and one nice. My mind was so mushed I couldn’t work out how to cross a road. I was whacked. I guess it was like putting petrol in a diesel engine, when everything splutters to a halt. Twitter was a lifeline for me when I started to improve. I loved the skill of using minimum characters and words to share a message, a thought, a joke. I rediscovered my love of words (and myself). And so claretsgirl the blog was born. A collection of musings, but mainly about mum, dad and Burnley FC. My final post on claretsgirl shared tributes at dad’s funeral. I left it there. No more claretsgirl blogging. I hope you’re keeping up. So this is the nice thing. 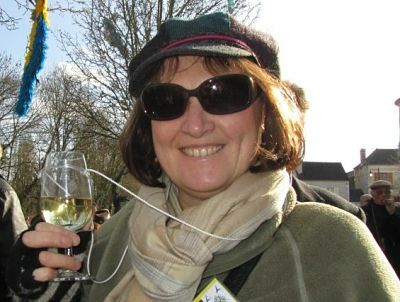 I went to Chablis and fell in love with wine. Sometimes journalists (I’m one) are invited on press trips. I was invited to Chablis. Well, it would have been rude not to go. If you’re reading this because of the footie bit and you don’t know about the wine bit, you’ll be going Chablis? Yeh? Right? And so ….? Chablis is a famous wine / village in Burgundy and you can read about the trip here … but don’t disappear just yet. I returned totally hooked on wine. This was like hooked on wine. The whole caboodle. E.V.E.R.Y.T.H.I.N.G. Back at home, I decided to learn more; I began a wine column called ….. and this is the next identity crisis bit …. One Foot in the Grapes. My name is Jane Clare. That’s my name. The name’s not for changing. I don’t want to lose that. It’s my club. And I’d be mightily pissed off if I gave up the name and someone else became @claretsgirl. I’m leaving that untouched. A little time capsule of memories living out there somewhere. My wine stuff. The name of this here place. I like the name. 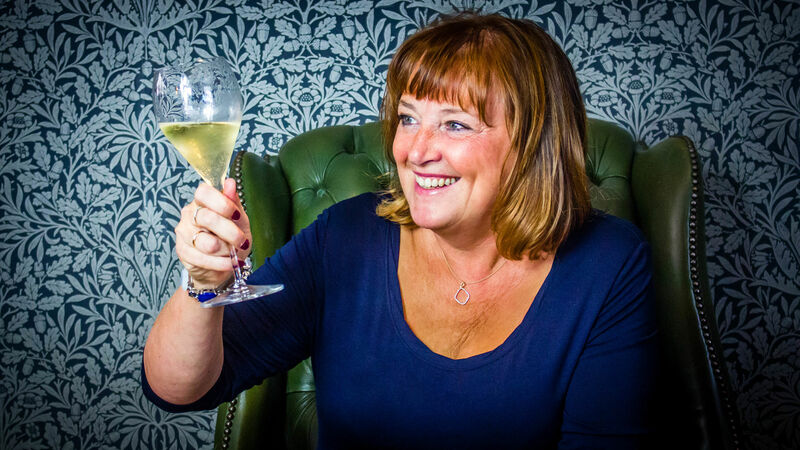 The reason I’m thinking about my identity crisis is this: I’m learning by example from other bloggers and wine lovers in the ether as they’re not scared about putting themselves forward and blogging about their lives and their love of wine. But I’ve gone a bit shy in my old age. I want to blog and I want to be brave enough to blog. So I’m dusting myself down. Giving myself a kick up the proverbial. But who am I? Do I need to refine my online persona? Can I have three identities? I have to get my act together and start being me. But which “me” is the question. My head’s in a tangle.